Read that article along with this one. 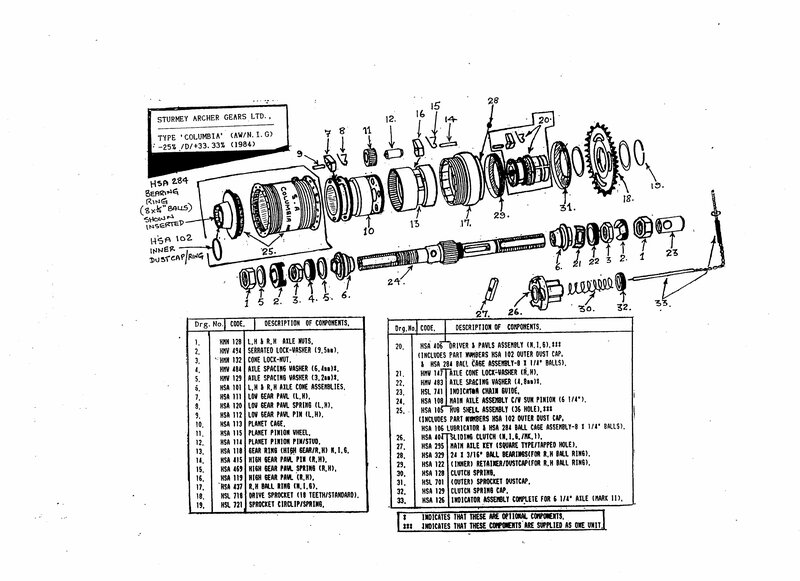 he common Sturmey-Archer three-speed hubs provide a direct drive middle gear, a high gear that is 4/3 of the middle gear, and a low gear that is 3/4 of the middle gear. (The principle of operation is explained on another page on this site.) 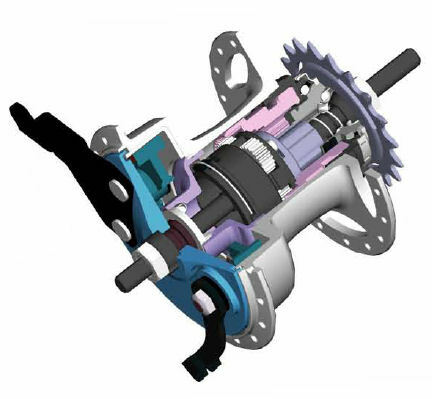 Among current hubs as of 2010, the S3X fixed-gear hub is different, with two step-down gears and a direct-drive gear, and a special Brompton hub has a wider range to use with two sprockets and a derailer for a total of 6 speeds. By modern standards, the typical English 3-speed bicycle is geared rather high. Most have 46/18 gearing, which gives gain ratios of 3.83, 5.11 and 6.81 (50, 66, and 89 inches; 4.00, 5.28 and 7.12 meters.) You can make riding a lot easier by customizing the gearing. 20 and 22 tooth sprockets are readily available, as well as smaller sizes for speed demons or small-wheel bicycles. It is also possible to modify Shimano cassette sprockets with a Dremel grinder if you need something bigger. This is not particularly difficult to do. There is more detailed information on this on another page. Sturmey-Archer has manufactured many models of 3-speed hubs over the years. Sturmey-Archer has the widest surrent selection of three-speed hubs of any manufacturer. Most have aluminum shells, and are relatively light compared with hubs of other brands. 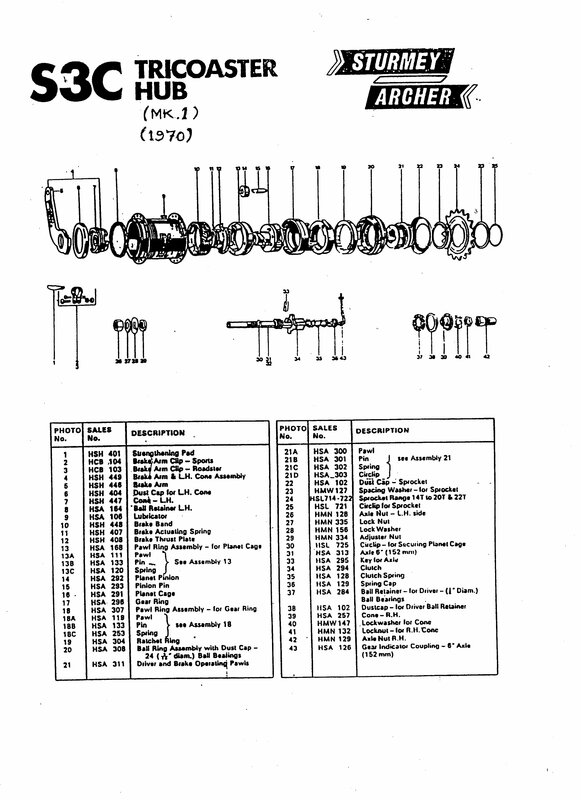 The information below is compiled from a review of the Sturmey-Archer Web site, Sturmey-Archer catalogs, and a Web search. 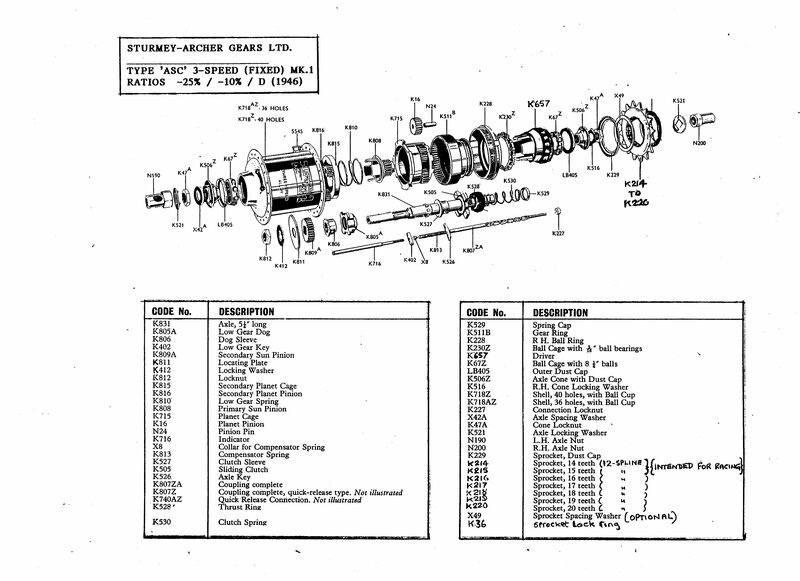 Technical information is available for most, but not all, current Sturmey-Archer 3-speed hubs. The newest three-speed coaster-brake hubs have been added to the comparative parts lists in Sutherland's Handbook of Internally Geared and Coaster Brake Hubs, now online on this site. Rows with yellow backgrounds in the table below are for hubs which are lsted in both the 2010 and 2015 catalogs. 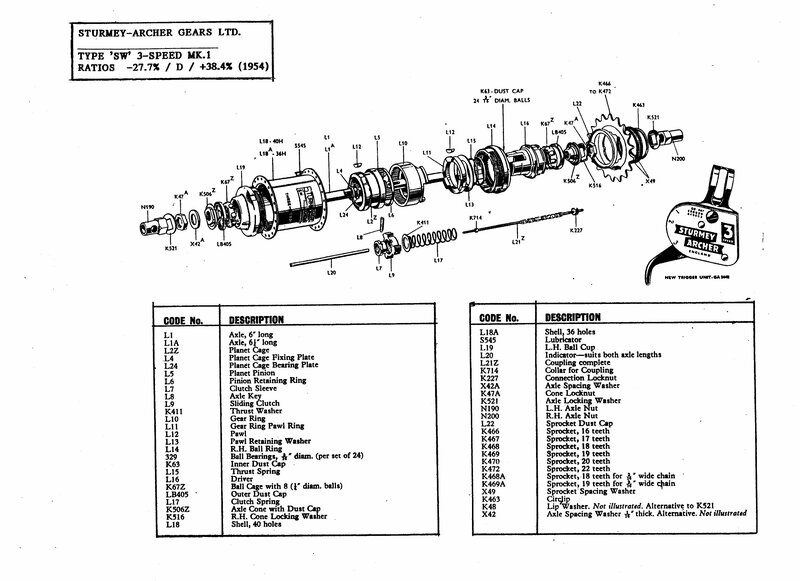 Links in the "Model" column will take you to Sturmey-Archer's page about the hub. Rows with green backgrounds are for hubs new since 2010. Rows with white backgrounds are for "ghost" hubs -- no longer sold, not in the 2015 catalog, and parts may no longer be available. On the other hand, many parts lists are available which were not in 2010, listed in the Documentation column. AB3 90 mm drum brake, steel shell Like SAB3; Also see AB/C. 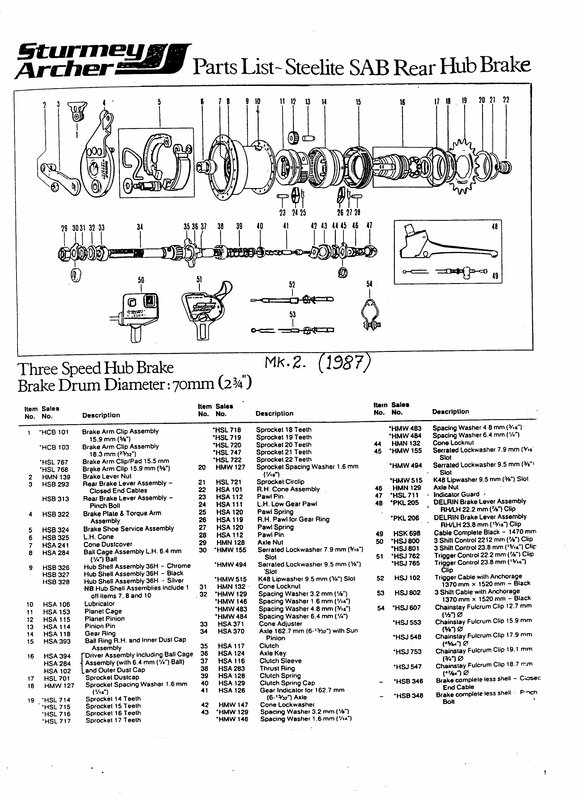 AB/C 90 mm drum brake, steel shell Technical information. AW No Intermediate Gear version -- not the classic AW. Steel shell. AWC(II) Coaster brake, steel shell -- slight modification of the earlier version. Same as S-RC3(II) except for the shell. BWR Special Brompton extra wide-ratio 3-speed used with 2 sprockets and a rear derailer to make a 6-speed hybrid-gearing system. This hub is apparently sold only through Brompton. Procedure is the same as for the S-RF3; driver and planet cage assembly are different. Video of disassembly/reassembly on Brompton site (requires that you establish a login). Video of disassembly-reassembly, narration is in French but you should be able to follow this anyway. QS-RC3 Gearbox for tricycle. Has reverse gear and coaster brake. RX-RD3 Rotary shifting, drum brake. S-RC3(II) Coaster brake. This is the same as the AWC(II) except that the shell is of aluminum..
TS-RF3 Gearbox for tricycle. Has reverse gear. There have been several licensed and unlicensed copies of the AW: Brampton, Hercules, Scintilla, Steyr, SunTour, Vibo. Most parts are interchangeable. The table below covers the more common older hubs and a few others of interest. 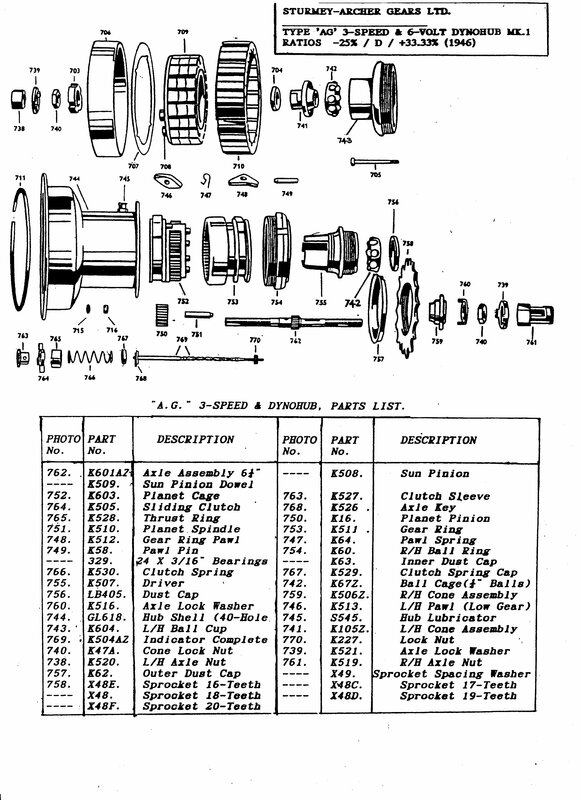 It omits specialty narrow-ratio hubs and hubs discontinued before 1940. Old Sturmey-Archer three-speeds other than the AW and closely-related models (AG, AB) can be tricky or impossible to repair, due to parts un-availability. 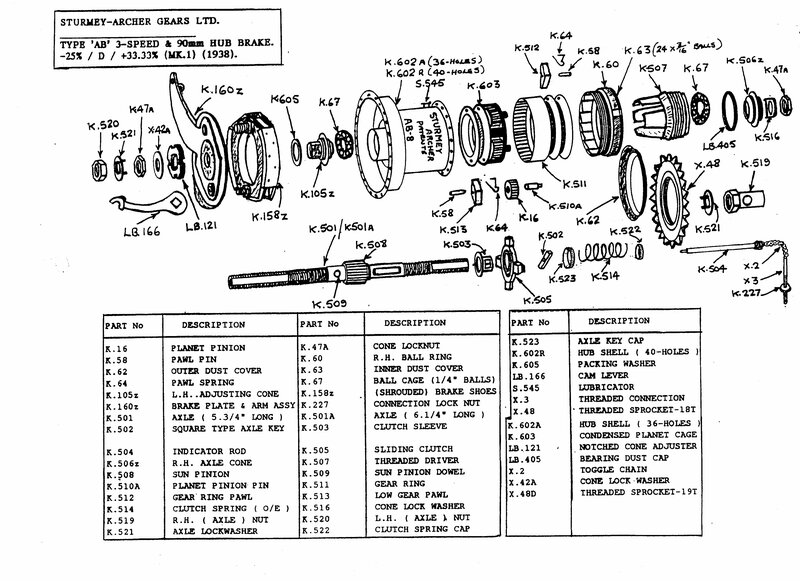 Sturmey-Archer changed its parts numbering system sometime around 1950. Older parts numbers begin with the letter K and newer ones, with H. If the model of the hub is the same, and the description of the part is the same, the part is almost always the same, despite the different numbering. Some of the classic references linked below use the "K" parts numbers. 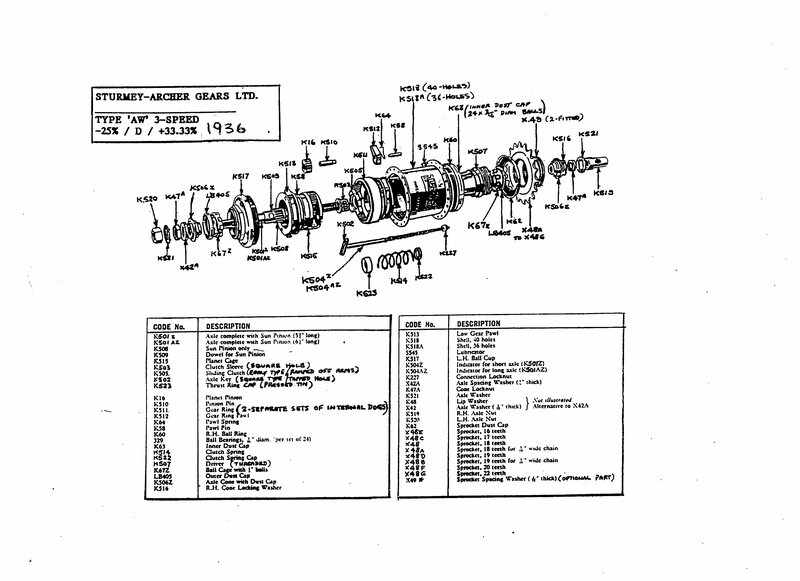 Sutherland's Handbook of Coaster Brake and Internally-Geared Hubs uses the newer part numbers. Older internal parts with a gray finish are reportedly more durable than newer ones with a black finish, due to a better surface-hardening treatment which had to be discontinued for environmental reasons. The AW's internals will fit into many Sturmey-Archer hub shells of the same era, making it possible to keep a wheel in service. One exception is that the left ball cup of many if not all four- and five-speed hubs lacks an inner flange to center the planet cage. 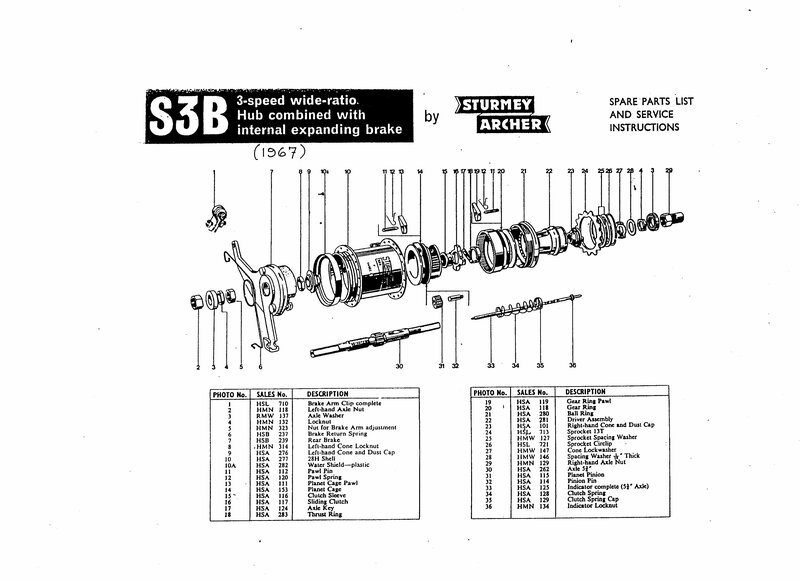 Sturmey-Archer historian Tony Hadland reports that 1984- and later steel AW shells will not accept S5 internals. Coaster-brake and drum-brake shells will not fit the AW. Older Sturmey-Archer coaster-brake hubs have safety issues: The brake of the TCW and S3C was actuated through the gear train, so it was weakest in high gear, when the bicyclist was going fastest! The TCW could lose the brake entirely if the cable was misadjusted, due to the neutral-gear position between second and third,. The AW and its near relatives also have a neutral gear, and if the cable is misadjusted, these hubs can drop out of gear. 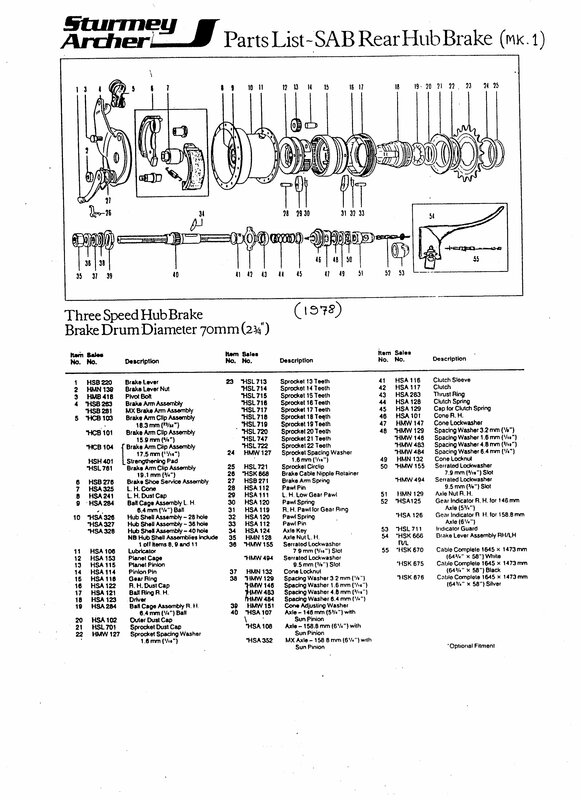 Jobst Brandt has, in addition, described a tendency of these hubs to slip out of high gear into neutral in a hard sprint -- though this problem does not occur under more usual conditions of use. See comments on this topic by Brandt. The Web sites linked below the table cover many additional older hubs. 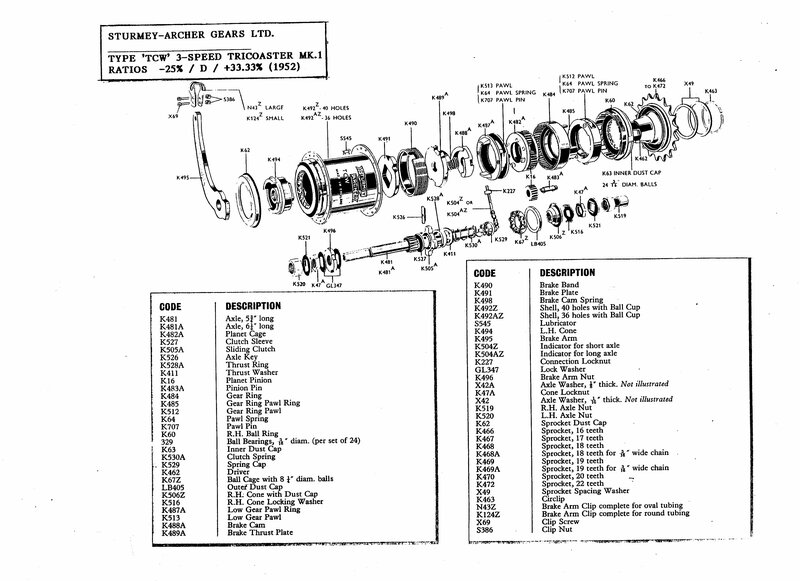 The Sturmey-Archer Heritage Web site has a wealth of historical and technical information. 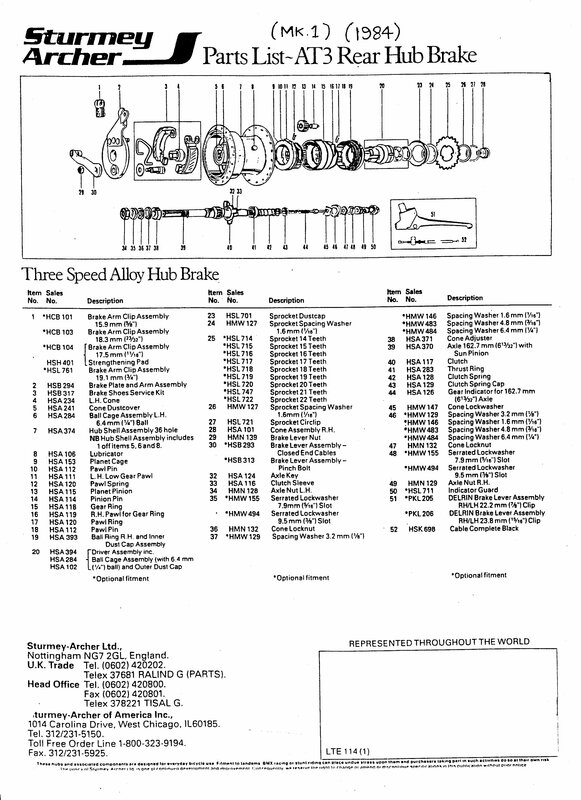 Tony Hadland's Web site includes an exploded drawing and parts list for nearly every Sturmey-Archer model up through 2001, as well as rebuilding information for many older hubs. Documentation on the older hubs is actually better than on current ones. Sturmey-Archer 1951 Service Manual on the Sturmey-Archer Heritage site.